An apple a day is the only way you can avoid the most oddball physician in the face of television. And Dr. Gregory House (Hugh Laurie) himself would shove the fruit down your throat if he could, because the anti-social wouldn’t even talk to his own patients if he had a choice! House is an action-packed comedy between a medical malady and the medical community. The artillery? Drugs (legal ones! ), X-ray machines, comprehensive medical insurance, and Dr. House’s very own unconventional—yet effective—diagnostic skills. He also has an elite team of health CSIs to help him solve the most baffling medical mysteries: a neurologist, an immunologist, and an intensevist. And like a bunch of hyperactive bacteria scurrying under a microscope, sparks are in a frenzy between Dr. House and Dr. Lisa Cuddy, the hospital administrator. Anything can happen in the hospital—especially with the unpredictable Dr. House around. But in sickness or in health, this cure for the common medical drama will give you loads of the best medicine: laughter! - Our loony doc was cast as The Daily Planet editor, Perry White, in the film Superman Returns by director Bryan Singer, but was unable to play the role due to his prior commitment to this season of House. Incidentally, House is backed by Bryan Singer's production company, Bad Hat Harry Productions. 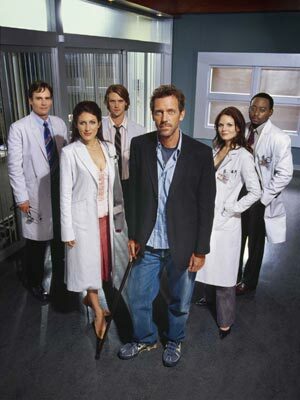 - When auditioning for the role of Dr. Gregory House, he spoke with such a flawless U.S. accent that Bryan Singer, as well as during script read-throughs.